Things have been crazy around here lately. Good crazy – the kind of crazy that involves lots of salsa classes and late-night dancing, pet-sitting my parents’ two big beautiful black dogs that I adore (but that are quite a handful! ), learning new things like pole dancing (so fun!) – but crazy nevertheless. All this running around has left me grasping for a way to come up with quick meals, while still maintaining a balanced diet and not skimping on cooking (at least not completely). I’ve had my good ole’ staples when I’m on the run – hummus with veggies, dry roasted almonds, fresh crunchy apples, etc. – but tonight I was craving something more. I wanted colors on my plate. I wanted something new, something that would involve creativity, but that wouldn’t take all night. So after getting back from my salsa class, I dropped my bags and went straight to the fridge. I spent a couple minutes eyeing the insides and weighing my options. I had a couple heads of broccoli, which I took out. That would take care of my vitamin C. I went back looking for something that would make a pretty contrast to the green of broccoli and found a bag of organic carrots (hello vitamin A!). I found the idea of simply steaming or baking broccoli and carrots boring, but I loved the idea of baking the broccoli and then drizzling a bright orange liquid on top of the crispy green stalks. I’d never made carrot sauce (I’d never even heard of such a thing), but I liked the concept and it couldn’t be that hard, right? Now I was excited! So I got to work peeling and chopping. And then, just like that, I am awakened out of my zone - the olive oil is hot, the onions get thrown in, where's that garlic press? - and I'm off, throwing everything together, listening to the sizzling of the vegetables, inhaling the smells that quickly surround me. 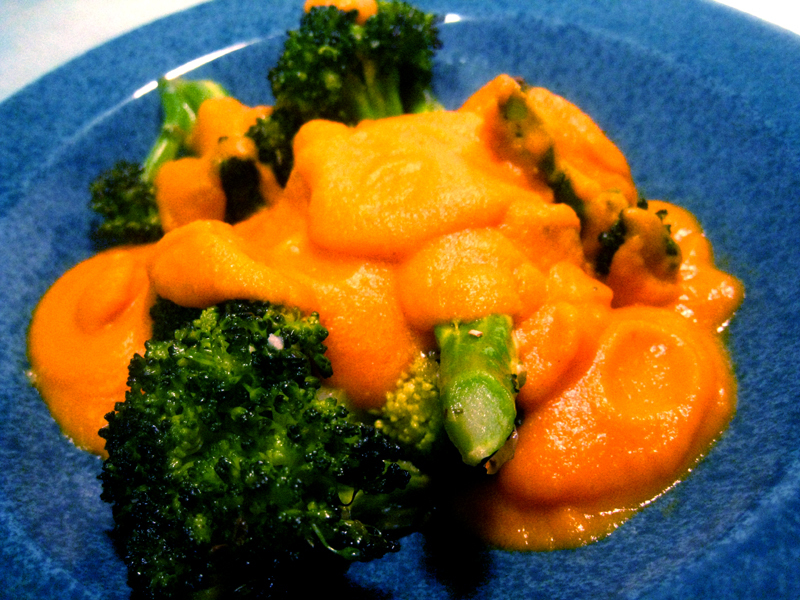 Before I know it, there it is: carrot sauce. I try it. It's smooth, sweet...but it's missing a little something. I throw in a dash of cayenne. Ah, there we go. Now it's got a kick. I peek into the oven and steal a stalk of slightly crispy broccoli. It's ready. And so, after a long day of work and dancing, I finally sit down with a hot steaming bowl of bright fresh colors. I take a bite - garlicky, a little crunchy, and smoothly sweet. Perfect. Sighing contentedly, I relax into the night. Cut the broccoli into bite size pieces (don't discard the stalk - it's full of extra calcium and iron! Just peel off the tough outer layer and slice the stalk up). 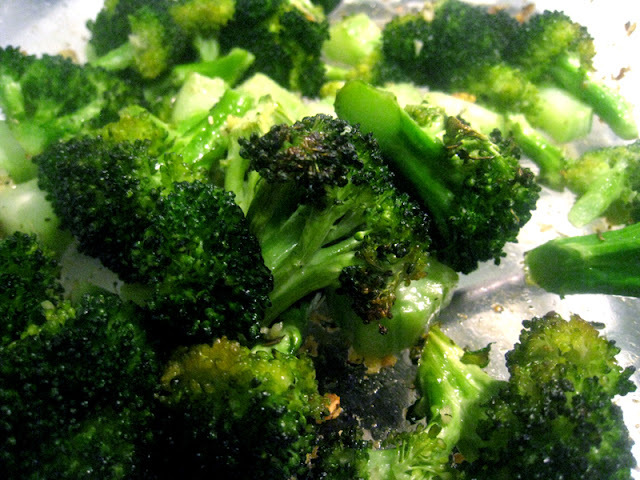 In an oven-proof dish, mix the broccoli with the garlic, olive oil, herbs, salt and pepper. Toss everything well, massaging the oil and garlic into the broccoli with your hands. Once everything is mixed, put the dish in the oven. Bake for 20-30 minutes turning every 5-10 minutes. If the broccoli is getting too crispy toward the end, turn the oven temperature down a bit. Sauté onions and garlic in olive oil until onions are translucent. Add cumin and coriander and sauté one more minute. Add carrots and cook for one minute stirring frequently to mix everything up. Add water and bring to boil. Once water is boiling, turn down to a simmer and add vegetable bouillon. Stir well to dissolve the bouillon. 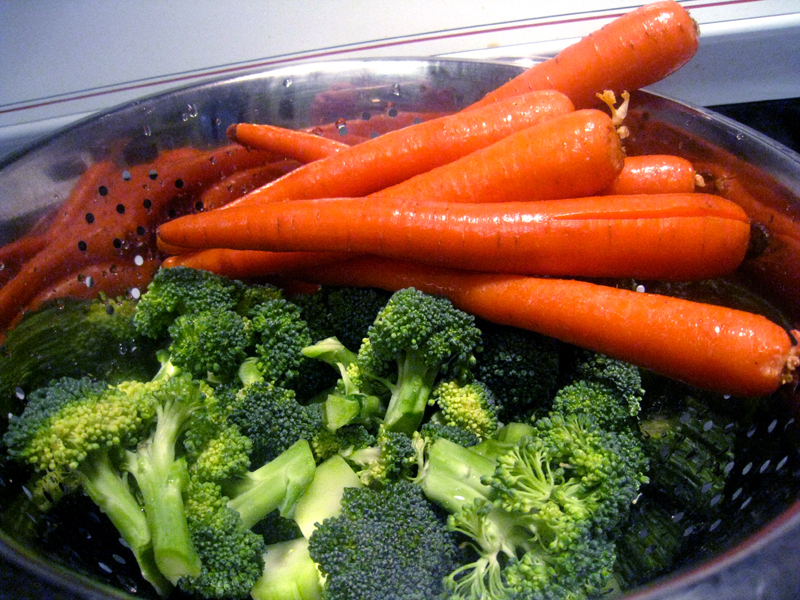 Cook everything on low for about 20 minutes, or until carrots are very tender. 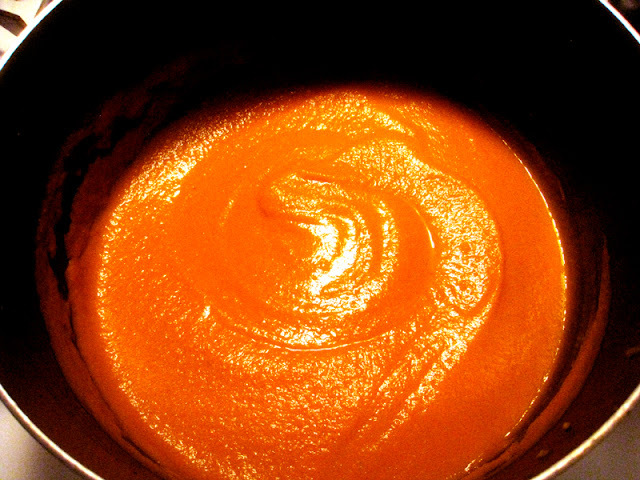 Once carrots are cooked, blend in batches and return to pot. Reheat and add cayenne pepper to taste. 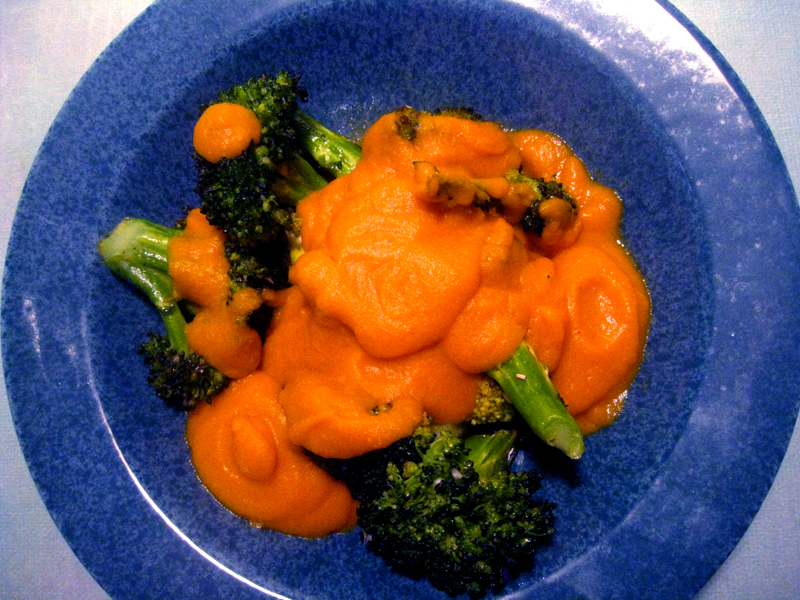 Spoon carrot sauce over roasted broccoli and enjoy!! It seems the weather is playing tricks on us. I had planned to write about soups full of comforting warmth this week, but with temperatures that reached close to 90º, soups just didn’t feel quite right (unless you ate them late at night when the temperatures were once again in their right minds). Instead, late afternoons found us searching for something refreshing, something that would cool us down but that still tasted of fall. So Josh took it upon himself to find a solution, and he did. 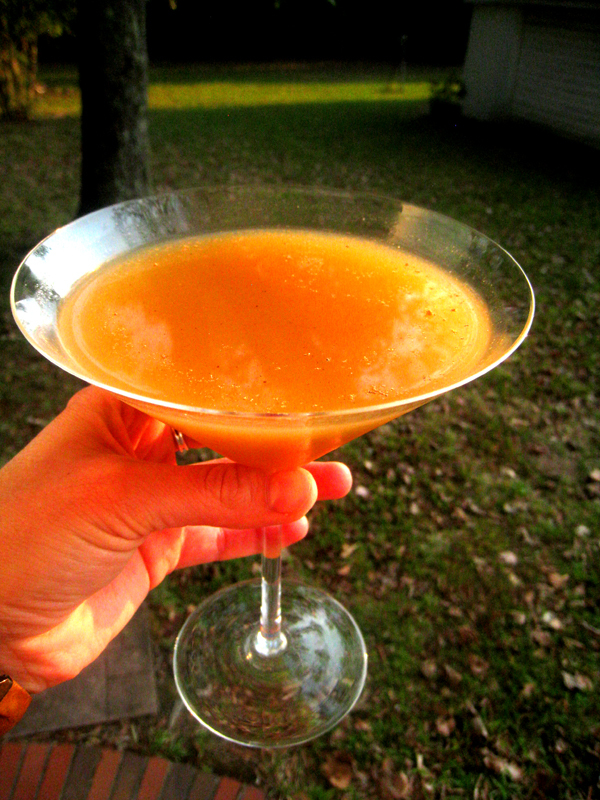 I present you – or, rather, he does – with: The Cider Martini. In other words: apple cider disguised in a summer suit. The glass in itself looks refreshing (oh, how I love martini glasses! ), but the true magic doesn’t happen until your lips touch the silky gold liquid. That first sip fills your senses with the delicious spiciness of autumn, but ends with a revitalizing kick that leaves you refreshed and all summery-fall feeling. It’s a drink that makes you smile, mixing nostalgia for a season that is past and excitement for one that is beginning. The following quantities make one glass. A shaker can hold two glasses worth, so just double the quantities and shake it all up if you're making this for two. Put the rum, whiskey, apple cider, and ice cubes in a shaker. Shake vigorously until well-combined and cold. Pour into a martini glass. Garnish with a sprinkle of spices and a cinnamon stick. Sip and enjoy! On Friday we threw fall a party. It’s the least we could do, really. When I think of all the gifts fall brings us every year – breathtaking scenery, cool temperatures, crisp blue skies…it even manages to do away with those pesky mosquitoes! – honoring it with some sort of celebration seemed like a small but necessary gesture. So we went out and gathered the ingredients that the season made readily available. We concentrated mainly on apples and asked friends to bring whatever stroke their fancy. 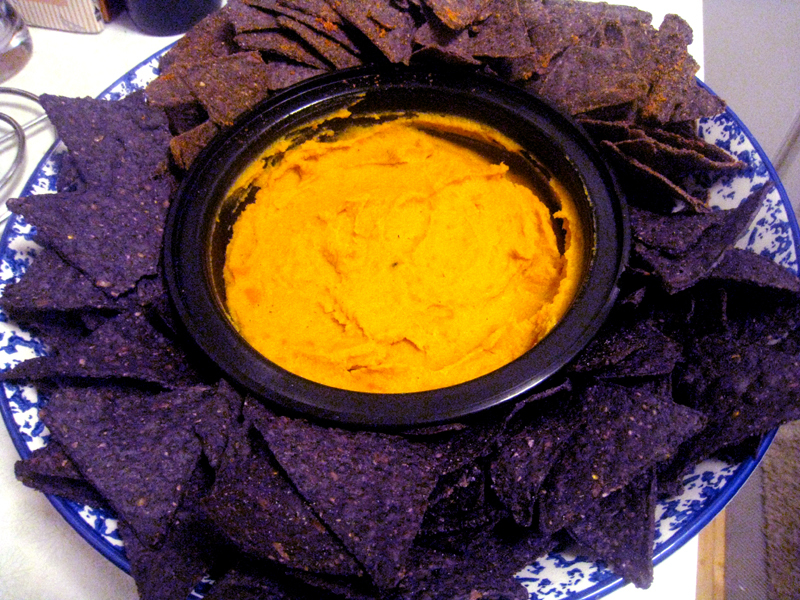 Someone brought a delicious curried sweet potato dip, while someone else brought a mouth-watering pumpkin cheesecake. I made baked goat cheese with honey and apples, a combination lusciously tart and sweet at the same time. Once baked, the apples become soft and just a little brown, melting into the warm cheese and creating a perfect silky bite with just the right amount of tang. We dug in without holding back. But the pièce de résistance was the mulled cider. I had it cooking on the stovetop when people started arriving, infusing the house with the scent of cinnamon and cloves. Pulled like magnets toward the spices, everyone walked straight to the kitchen, sniffing the air and inhaling deeply, nose above the pot and eyes closed in sensory pleasure. I made three huge pots of it throughout the night. We kept taking breaks from the singing and music by the fire in the backyard to come back in and refill cups with the warming fall drink, relaxing more into the coziness of the evening with every sip. And so, on this second Friday in October, we officially welcomed fall with steaming mugs of cider, friends, music, a bonfire, and belly laughs that ricocheted deep into the crisp night air. This recipe makes 6 mugs full once you add the liquor. The original recipe calls for brandy, but we used rum and/or whiskey. My favorite is rum with a splash of whiskey - I don't usually like whiskey, but in this drink it gives it a nice little kick. I highly recommend it! The recipe is also delicious with no alcohol, but it will make less. Select 6 mugs. 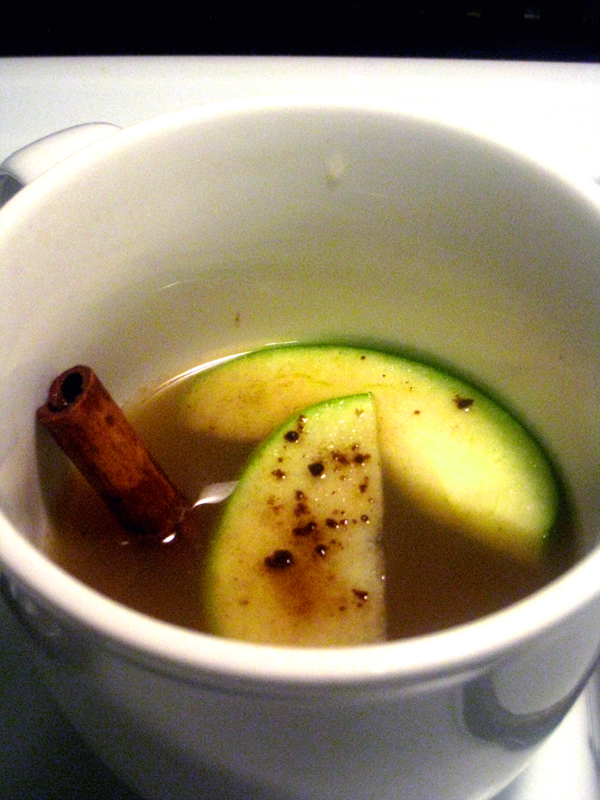 In a saucepan over medium heat, combine the cider, honey, allspice, nutmeg, cloves, and 2 of the cinnamon sticks. Bring to just below a simmer and reduce the heat to low. Cook for about 20 minutes. Pour desired amount of liquor in a mug. (Start slow if you're not sure how much you like - you can always add more!) Divide the hot cider mixture evenly among the mugs, pouring it through a fine-mesh sieve. 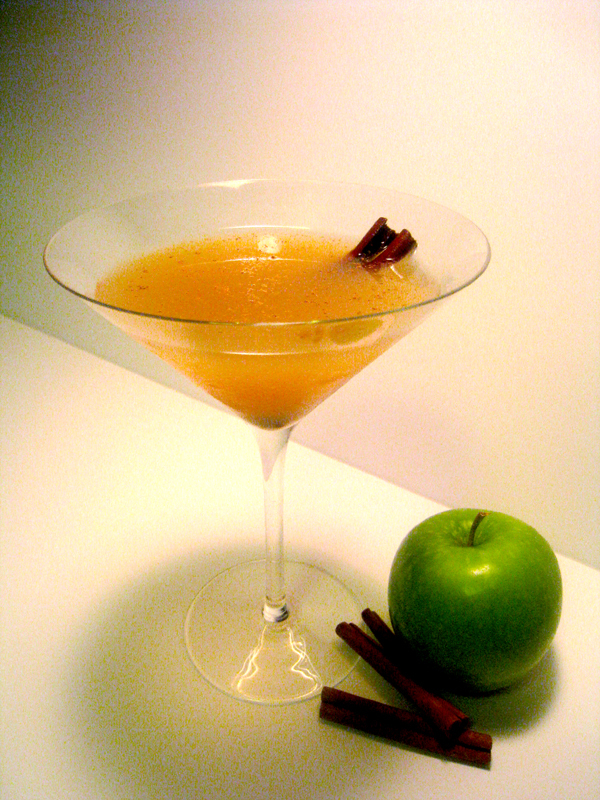 Garnish each serving with a cinnamon stick, a sprinkle of your favorite spice, and 1 or 2 apple slices. Serve at once! Note: Since I wanted people to be able to come and get refills whenever they wanted, I doubled the recipe and, once it was ready, passed it through the sieve into another pot, which I kept on low heat so that it stayed hot. I left a laddle next to it and people were able to get refills throughout the night without having to deal with filtering the liquid. Place the log of goat cheese on a baking sheet. Flatten it some with a spatula. Halve and core the apple and thinly slice it lengthwise. Put the apple slices in a bowl, add the lemon juice and 1 tablespoon of the honey, and turn the apples to coat. 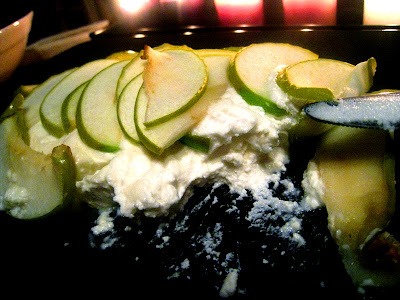 Drizzle the remaining two tablespoons honey over the cheese, and layer the apple slices on top. 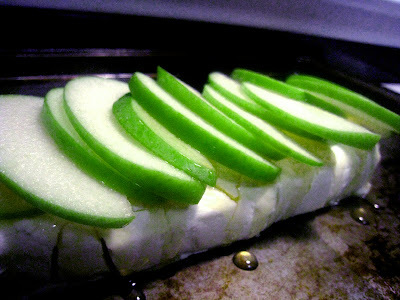 Bake until the cheese is warm throughout and softened and the apples are tender, 8-10 minutes. Using a wide spatula, transfer the cheese to a platter. Serve warm with crackers! The air is turning cool. Leaves – yellow, orange, red, and brown – are dancing across roads and yards, slowly covering the ground with their fiery fall blanket. Yesterday, Josh and I woke up to a house that smelled of change...something new was all around us. We had left the windows open throughout the night and the air was crisp and cool. I made my way to the kitchen for my morning coffee dressed in a sweater, cozy pants and thick socks. I looked out the window and saw bright blue skies; the blue a little deeper and bluer than usual, indicating cool weather. I breathed in the deep fresh air and sighed happily. It is time for backyard bonfires, blankets, sweaters, and hot apple cider. 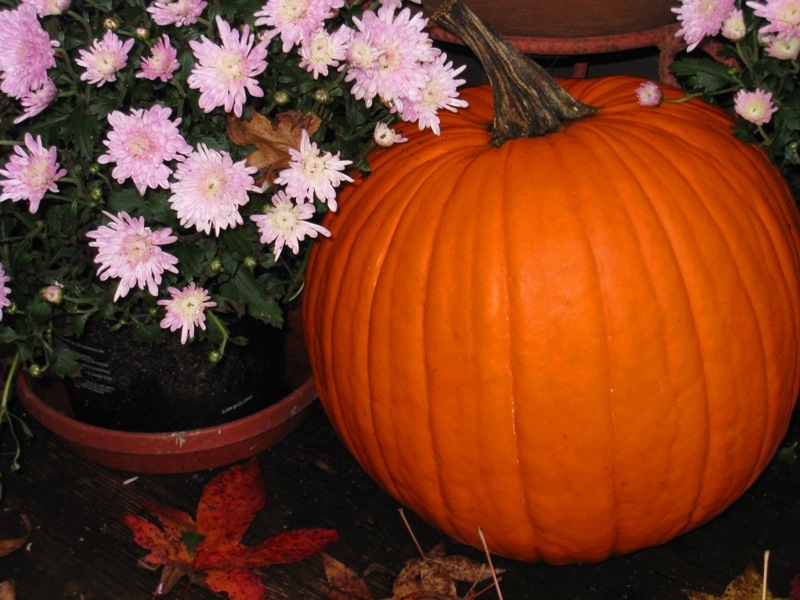 It’s the season for pumpkin, apples, butternut squash…and warm cozy houses that smell of cinnamon and allspice. Soon we will be with friends in the yard, sitting around a fire, playing music, sipping cinnamon spiced wine, and watching our laughter dance and disappear into the cool night air. Oats. For a long time this was a word that I dismissed quickly, casting it aside and throwing it in the “not-for-me” – deep sigh – bucket whenever I heard someone talk about it or whenever it appeared in a recipe. I cringed at how unfair it was that, just because this super-healthy grain contained a small amount of gluten, it was off-limits to me. I realize, of course, that I’m a little late in making this triumphant statement. Gluten-free oats have been available on the market for some time now, but I’ve been afraid of trying them. They were off-limits for such a long time that, once they became available, I walked by the packages glancing at their “gluten-free” announcement with a dubious eye…was this a marketing ploy? I mean, how can you extract gluten from something that naturally contains it? I still don’t know the answer to that question, but I am happy to announce that I took the leap, bought the questionable oats, and tried them. I loved them. And so did my body! I don’t know how they did it, but they got the gluten out. Really. So, I can now (gleefully) state that oats, dear reader, are back in my kitchen. Along with all their high-fiber, cancer-fighting, heart-promoting, immune-enhancing benefits. Life is good. The second I knew oats were back on the table, I found myself experimenting. 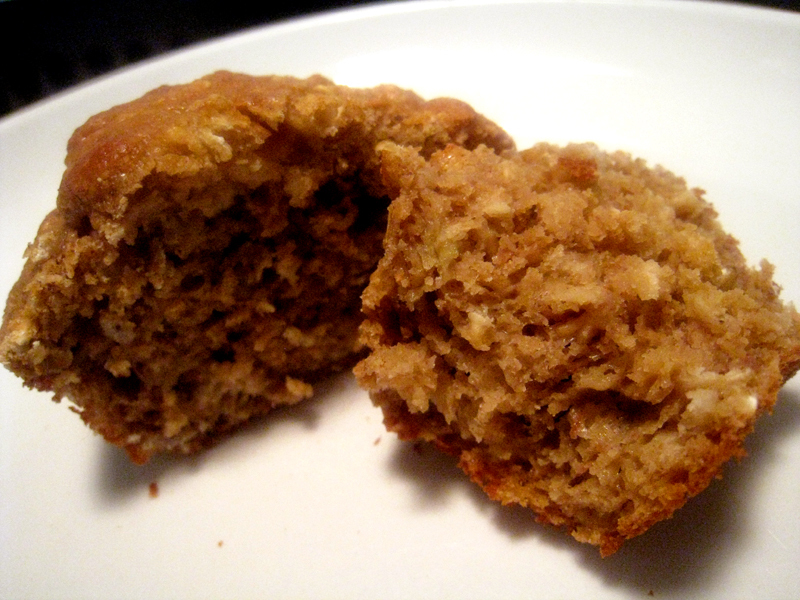 I started looking around for inspiration and recipes and was thrilled to find a recipe for oat muffins that called for no flour other than oat flour! I am always trying to find ways to bake gluten-free with less highly refined flour, but it’s hard to do since all the very-white very-refined flours (like cornstarch or tapioca starch or potato flour) are what give gluten-free baked goods their light quality. I immediately tried this recipe and was delighted with the results. You can even make your own oat flour from gluten-free oats by milling them in a food processor (1.5 cups oats equals about 1 cup oat flour). 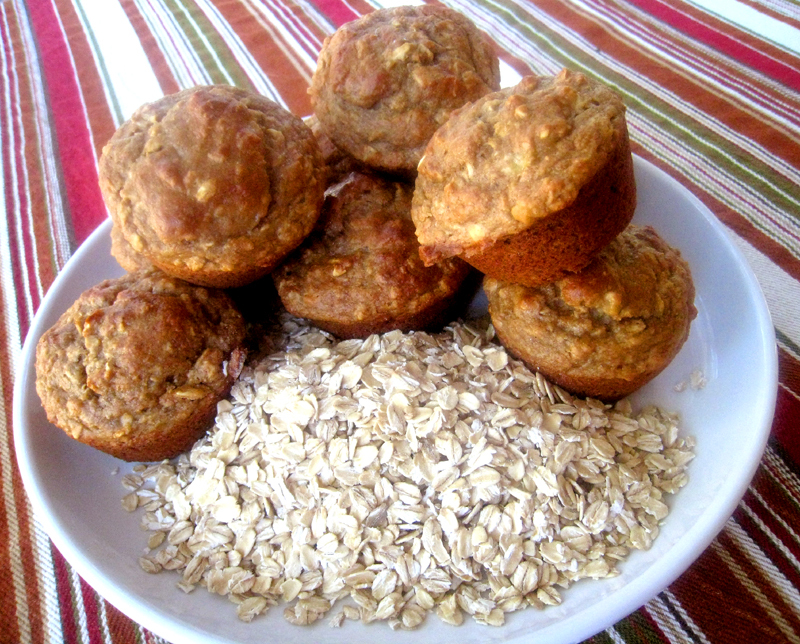 These banana oat muffins are packed full of nutrients with 4 grams of fiber, 10% of your daily iron requirement, and 9% of your daily need for calcium in each one. I replaced the oil with unsweetened organic applesauce, so there is no saturated fat! In a bowl, mix together the gluten-free rolled oats, yogurt, and milk. Let soak 10 minutes. Meanwhile, mix oat flour, salt, spices, baking powder, and baking soda in another bowl. In yet a third bowl, mix brown sugar, applesauce, mashed bananas, and egg. Add egg mixture to dry ingredients and mix well. Add to the rolled oats mixture. Gently fold in the walnuts. Fill greased or paper-lined muffin cups 2/3 full (they may end up being a little more than 2/3 full in order to use up all the batter, which is fine). Bake for 20 minutes. Makes 12 muffins. Eat warm out of the oven! These will last about a week if kept in a sealed container and are delicious after a couple days reheated and served with butter and honey. Enjoy!